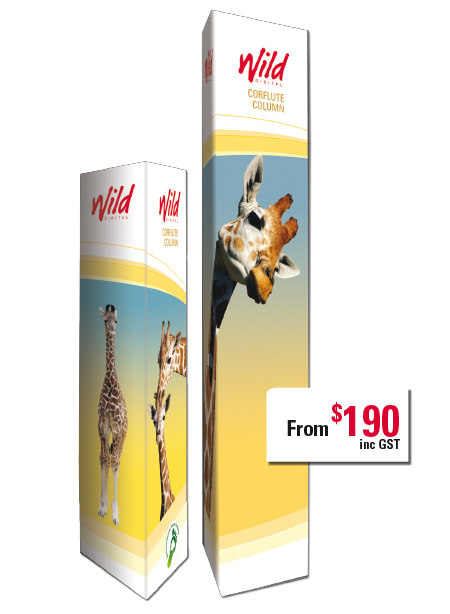 Wild Digital - Corflute Columns - lightweight corflute displays. Corflute columns are lightweight, weatherproof display columns. They are an extremely cost effective, high impact way to add colour and structure to your display space, shop entry or foyer. Use them to cover up crash barriers or other un-slightly poles. They are available up to 2.4 metres in height, have graphics that are visible from any angle and come with or without brochure holders. When not in use they fold flat so they are easy to transport and don’t take up storage space. If there’s a better “bang for your buck” solution out there, we haven’t heard of it yet! Sizes: Available in three heights – 1500mm, 1800mm and 2400mm. Price: 1500mm – $190 (inc GST). 1800mm – $220 (inc GST). 2400mm – $290 (inc GST).